When your PC cannot recognize a "Memory Stick", re-format the "Memory Stick" with Memory Stick Formatter to allow your computer to recognize it again. Formatting means to delete all data stored on a "Memory Stick" and return it to the original state in which you purchased it. Version 2.5.05090 is a freeware program which does not have restrictions and it's free so it doesn't cost anything. 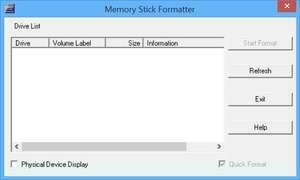 For security reasons, you should also check out the Memory Stick Formatter download at LO4D.com which includes virus and malware tests. Additional screenshots of this application download may be available, too. 3 out of 5 based on 38 ratings. Memory Stick Formatter has a presence on social networks.